Truth and Fiction: Who’s Really Behind Terrorist Attacks in Kenya? Home › al-Shabaab › Truth and Fiction: Who’s Really Behind Terrorist Attacks in Kenya? Terrorist operations in Nairobi, Mombasa, Mpeketoni and other sites in Kenya’s urban and coastal towns have driven a polemic debate about who exactly is responsible. Before and after al-Shabaab’s September 2013 attack at the Westgate Mall, dozens of unclaimed grenade and IED explosions in the country caused considerable confusion among the public about whether the bombs were the work of al-Shabaab, local affiliate al-Hijra, or even “false flag” attacks by rival Kenyan businessmen. Now that al-Shabaab has increased the number of attacks it has claimed in Kenya, Uhuru Kenyatta’s administration has been absolving them at each opportunity and blaming various opposition groups and politicians instead. If Uhuru is correct in claiming that al-Shabaab (and its local affiliate al-Hijra) are not responsible for recent attacks, it would mean that the estimated 700 al-Hijra members and countless al-Shabaab militants (from various countries) that are able to cross the porous border with Somalia have been decisively silent in recent months. In many ways, this is an unlikely proposition. To many observers, Uhuru’s deflection of al-Shabaab claims is a continuation of a strategy in which he has blamed the opposition for using “hate speech” and incitement that could be used to instigate early elections–or worse–mass violence at a level seen during the ’07-’08 election crisis that could force another coalition government. If you believe the hype, it’s Raila’s would-be coup by another name. These days, Uhuru’s simmering allegations have thickened to the point of blaming rival political elements for terrorist attacks as well. The strategy could easily backfire. If Uhuru’s allegations are credible that politicians, aggrieved Coastal squatters, criminal gangs, and separatist groups all have the capability and desire to organize attacks at the current magnitude, this would be a damning revelation about the ineffectiveness of the administration’s post-Westgate response to insecurity. But all these claims hinge of evidence that is hard to sort through. The biggest problem with Uhuru’s claims is that clear cut evidence has not been presented about who has been responsible for most of the attacks. For example, the alleged driver of Mpeketoni militants Diana Salim Suleiman claimed he was viciously beaten and his matatu hijacked as militants forced him to act as the chaffeur from hell during the June 15 attacks claimed by al-Shabaab. Additionally, the Kenyan government (GoK) said it had “prior intelligence” of an imminent threat around Lamu before the Mpeketoni attack. This would ostensibly indicate that GoK would have some tangible proof of key individuals or groups that were organizing the attack. However, after the attack, United Democratic Forum (UDF) member and Lamu governor Issa Timamy was booked on murder/terrorism charges without any convincing evidence being presented publicly. In fact, police even asked for more time after his arrest to search for more evidence–all signs that this was not a slam dunk case as of yet. 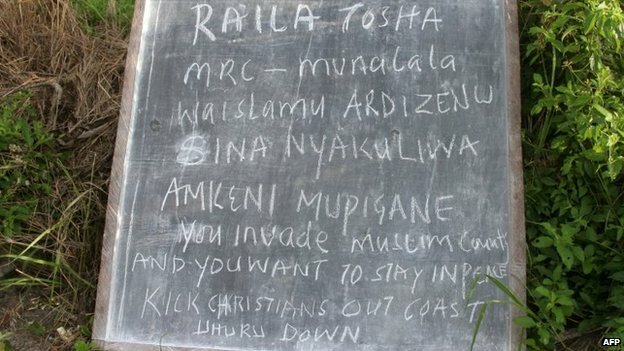 After al-Shabaab claimed carrying out operations in the Hindi and Gamba areas, Kenyan police blamed the Mombasa Republican Council (MRC) separatists after finding hastily scribbled messages referencing the group (and CORD leader Raila Odinga) on a small school blackboard. But the meaning of the messages was not perfectly clear. The first message read in Kiswahili “Raila [is] sufficient.” This could have been a reference to his call for Kenyan troops to withdraw from Somalia–or any other number of interpretations. The second message appeared to be directed at MRC members–not from them as interpreted by Kenyan police. It called for “sleeping” Muslims in MRC to “wake up”–followed by very specific anti-Uhuru anti-Christian imperatives. If this was the basis for blaming MRC, Kenyan police look as if they have a case that is weak enough to preclude singling the group out as exclusively responsible–especially considering the tactics used in the operations. Notably, the Westgate attack also may have used the resources of an al-Hijra-linked al-Shabaab leader for Kenyans named Sheikh Ahmad Iman Ali–who may have a hand in Coast attacks as well. The recite-or-die tactic does not appear to have been used by other opposition groups in Kenya–though the knife and arson attacks that have occurred are alleged modes of operation for MRC. Additionally, it has been rumored in the past that al-Shabaab has tried to recruit among extreme factions of MRC–which has both Christian and Muslim membership. This convenient exploitation is possible, and al-Shabaab has recruited from other East African groups with grievances including Uamsho and the Ansar Muslim Youth Centre in Tanzania. Setting MRC to the side, there are plenty of other grievances holders on the Coast that still seek redress. 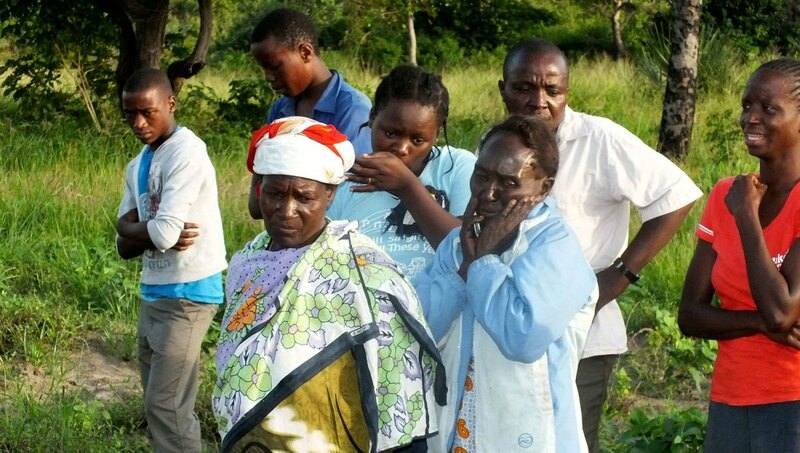 Since GoK has failed to address the fact that many local communities on the Coast have had land stolen from them by government officials and other tribes in the last several decades, it is no surprise that al-Shabaab would be recruiting among them. As many of these potential recruits would be Muslim “squatters,” their narratives are interesting to unwrap in the regional context. When Coast attackers speak of “Christian invaders” stealing territory and abusing Muslims in “Muslim lands,” their argument is applicable to them both in Kenya and Somalia. Al-Shabaab is using this duality to its advantage by recruiting and carrying out attacks in both countries. Contrastingly, Uhuru is misguidedly re-framing the argument as a mostly local and tribal issue–seemingly in pursuit of his own political agenda while ignoring the larger context. Uhuru is able to redirect blame at “local political networks” rather than open up the possibility that extremist groups are exploiting these very dynamics. Common sense on recent attacks in Kenya point to al-Shabaab and its affiliated sympathizers, but this should not discount other actors. Equally important, understanding the possibilities of who is working with extremist groups requires a realization that different types of people are involved: those possibly looking for a quick buck, those allegedly kidnapped by extremists, Kenyans not “of Somali origin,” and potentially others with varying motivations. Without knowing the nature of the problem, Kenya can not claim to know the nature of the solution. The GoK’s failure to present concrete evidence about who is responsible, its non-sensical and ineffective policies in response to attacks, and its politicization of investigations will further sow confusion and subsequent scapegoating among the public against blameless targets. It is this kind of increased social anxiety and resorting to stereotyping that could exacerbate tribal and religious tensions that extremists need to legitimize their cause and violent operations. While Uhuru should in theory rush to correct these mis-steps, security often plays second fiddle to domestic political goals. It must be some hidden intentions and actions of some Kenyan Citizens or any other outsiders. I personally think differently than those of you rewrite the old simplistic and unpolitical novels about the current security crises in Kenya. This must be related to some sovereign nations which share borders and national interests as Kenya. Ethiopia and Uganda must be finger-pointed. Because these two countries are not comfortable with Kenya´s intervention in Somalia on two reasons. (1) Somalia was destabilized many years ago therefore Ethiopia considered Somalia as a part of its daily business and who ever interferes Somalia`s affairs must have stabbed Ethiopia. 2, Geopolitics and competition between the eastern african countries especially Kenya, Uganda and Ethiopia is traceable here. Whoever to respond to this competition as an action of violence hires some criminal to bomb and destroy the opponents. The later is the most truthful scenario because of one simple reason. Have you ever heard that a bomb was exploded in any single yard or piece of land in Ethiopia`s territories ?? Why you did not heard that? Is it because there is no muslim there? or is it because there is no Somalis there? No !! Ethiopia shares longest border line with Somalia and more than of the Ethiopian are muslims. Why suicide bombing are targeted to only Kenya, Uganda and Djibouti? Are they the only countries contributed troops to Somalia? No they are not? So think twice and come up with some reliable and valuable news based on unbiasedness.